How’s your 2018 going so far? Time really is flying this year – we can’t believe it’s the end of March already! As the first quarter of 2018 comes to an end, it’s time to review what we’ve achieved in the last three months against the plans we put in place at the start of the year. This is something all business owners should do – and should naturally include an evaluation of your social media activity, so you can make changes to anything that’s not working. But hold on a minute, here are a couple of questions for you: Did you create a social media plan for 2018 in the first place? And if you did, and haven’t followed it, how will you sort things out so you make a better show in quarter two? Sadly, the answers to these questions from many business owners we speak to are ‘No’ and ‘Nothing’ respectively. This is despite the fact that we all know that consistency of activity and messaging on social media is the key to results and success! And whilst you might think it’s just the smaller business owners who are struggling, that’s not the case – some of the bigger players are just as guilty! We recently visited a client with over 150 staff who’s relying on their website as their sole form of marketing. No blog, no social media, no nothing. Just the website. And do you know what? That’s pretty common! Here at Cureton Consulting, we know the damage that reactive (as opposed to planned and proactive) marketing can do to a business, especially on social media. We wanted to show people that it doesn’t need to take vast amounts of time, skill and resource to create and implement a social media strategy that really works. That’s why we decided to run a FREE mini-course in March 2018 to give business owners a taste of what they can achieve. We were gobsmacked by the reaction! No fewer than 58 people signed up and we’re already being asked when we’re running the next course (see below). Everyone who attended had one thing in common: they were all finding it hard to discipline themselves to plan their social media activities but hadn’t got around to doing anything about it. Luckily, we’d designed the course with just this audience in mind. 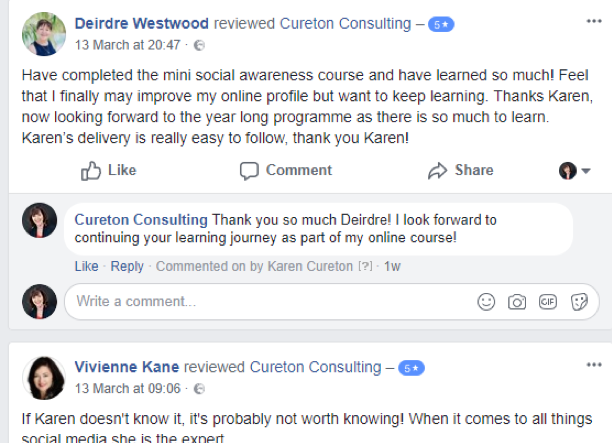 The idea was to provide a condensed version of our popular Social Media Mastery programme in 30-minute online training sessions over five days. 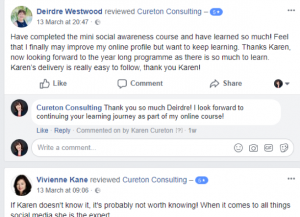 By breaking down the course content into bite-sized chunks, we avoided swamping people with too much information – whilst tantalising them with the benefits of the full Social Media Mastery programme at the same time! We had such a great response to our first course that we’re running another one, starting on Monday 14th May. Once again, the course will be completely free, so if you’re keen to get your social media sorted, there’s no excuse not to sign up! The course will start with a live 30-minute introduction using video conferencing on the first day. This will include a Q&A session. Then over the next four days, you’ll be given four more half hour training modules, all delivered online for your convenience. How to turn contacts, likers and followers into paying clients. As well as the five online sessions, you’ll have access to a secret Facebook group throughout the week, where we’ll answer more of your questions and you can share ideas and experiences with your fellow delegates. All in all, we’re only asking for two and a half hours of your time (plus whatever you choose to do on Facebook) and we won’t even charge for sharing our knowledge with you! By the end of the course, you’ll have everything you need to get your social media sorted for the rest of the year. But if you’re still not sure, don’t worry – there’s lots more help on hand from Cureton Consulting! Whether you’d like more training on Twitter and/or LinkedIn, or want us to manage your social media on your behalf, we’ll provide what you’re looking for. Interested? Book on our May mini-course now! To book a place, please call us on 01530 440 597 or email hello@curetonconsulting.co.uk. Or, you can fill in our online enquiry form with your questions and we’ll get back to you as soon as we can. And don’t forget to explore our website to discover even more ways we can help your business!